This March, with your help, the Petco Foundation is creating the world's largest photo mosaic mural of adopted pets and their people both online and live in New York City! Snap and submit your photo showing how Love Changes Everything, then share it for a chance to win prizes from our friends at WholeHearted, Petco, and MUTTS! Add the name of the animal shelter or rescue group where you adopted your pet and they'll have a chance to receive grant awards to support their lifesaving work! 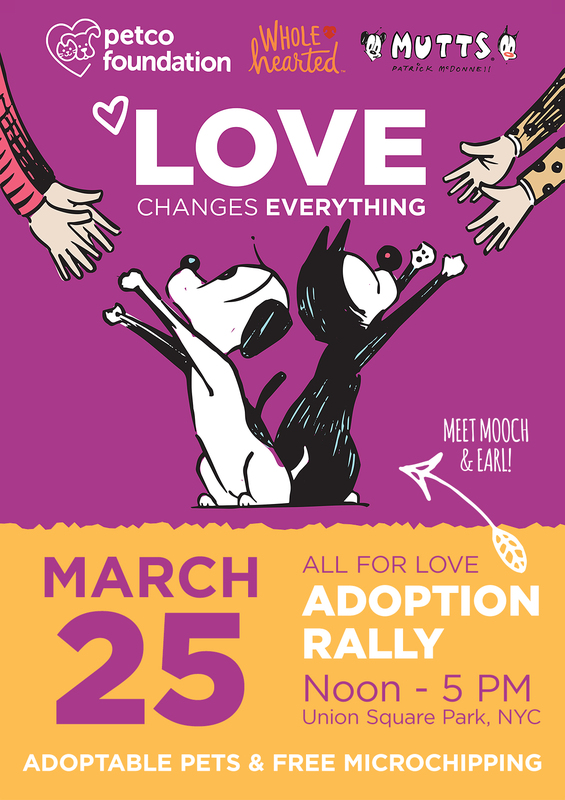 On Sunday, March 25, join the fun in New York City's Union Square Park to see the mosaic come to life at the huge All for Love Adoption Rally, or watch live on Facebook. The Mayor's Alliance for NYC's Animals is proud to support the Petco Foundation's All for Love Adoption Rally, powered in partnership with WholeHearted, MUTTS, and 1010 WINS. Join us for a day of family-friendly fun featuring the world's largest photo mosaic mural of adopted pets and their people, and celebrate the love that saves animal lives! More than 200 dogs, cats, puppies, kittens, and rabbits will be available for adoption from more than 20 New York City area animal shelters and rescue groups. Confirmed organizations include Animal Care Centers of NYC (ACC), Animal Haven, Anjellicle Cats Rescue, Best Friends–New York, Bideawee, Bronx Tails Cat Rescue, Brooklyn Animal Resource Coalition (BARC), Cypress Feline Rescue, Foster Dogs NYC, Grateful Greyhounds , Husky House, K9Kastle, KittyKind, Linda's Cat Assistance, Long Island Bulldog Rescue, Louie's Legacy Animal Rescue, Meow Parlour, Muddy Paws Rescue, Posh Pets Rescue, PupStarz Rescue, Rabbit Rescue & Rehab/NYC Metro Rabbit, Ruff House Rescue, and Second Chance Rescue. Get Free Microchips & Pet Care Information! Learn tricks and training tips from Petco certified trainers on the Dog Training Field. Get answers to all of your pet care questions from a team of Petco experts. Submit your photo showing how Love Changes Everything, and watch the unveiling of the world's largest photo mosaic mural of adopted pets and their people. Professional photographers from HeARTs Speak will be on hand to capture the perfect shot of you and your pet. Meet MUTTS comic strip creator (and Brooklyn resident) Patrick McDonnell and his characters, Mooch and Earl. Be there for a special Facebook Live webcast anchored by Susan Richard of 1010WINS and All For Animals TV. Learn about Jackson Galaxy's Cat Camp, returning to NYC on May 5 & 6, 2018. Learn about Finding Rover, the pet lost and found app with facial recognition.